I’m going to Miami next week….I’m not fond of Art Fairs– but bidness is bidness……this one is for Art Basel/Miami…and I mean this in the nicest possible way…. 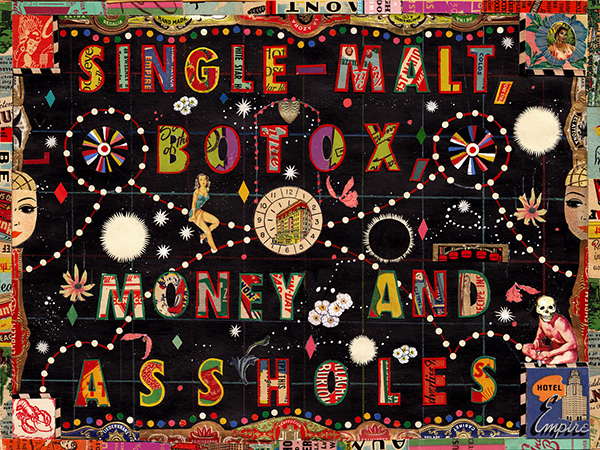 Tony Fitzpatrick, The Art Racket #2, 2012, sollage, size unspecified. Editor’s note: What is SEVEN? SEVEN is an alternative to the big art fairs that take place in Miami every December.A collective comprising BravinLee programs, Hales Gallery, Pierogi Gallery, Postmasters, P.P.O.W, Ronald Feldman Fine Arts and Winkleman Gallery, SEVEN “looks beyond the art fair model to create a new platform for viewing and acquiring works of art.” Note that SEVEN has a new location this year.